This is the Balearic isle perfect for those seeking the slow travel pleasures of artisan food and authentic cultural experiences. Forget manic sightseeing and instead immerse yourself in Menorcan island life at this traditional 19th century farmstead, now reimagined as a characterful rural hotel; with gourmet restaurant, spa, and now a boutique winery. Meet the estate’s wine maker, César Palomino Guzmán, explore the vineyards and taste the new Torralbenc wines. Kick back and allow yourself to be embraced by the tranquillity of the surrounding wild flower meadows, olive groves and vine yards. Period townhouses have been converted into a boutique hotel and spa in the island’s capital of Mahón. Eclectic design and art complement the rich historic features. Book a loft suite for a romantic stay. Learn how award-winning Mahón-Menorca cheese is made using age-old artisan methods at this rural farm hotel, in the hills, north of Ferreries. Guest rooms with terraces overlook pastoral scenery down to the Mediterranean. This is also where you’ll find one of the best local breakfasts on the island – the restaurant is also open to non-residents. This is probably the finest Menorca slow food experience. Chef Silvia Anglada and her partner Toni have pioneered the ‘0km’ commitment of slow food at their elegant restaurant. They buy local, and where possible organic to support the diversity of artisan products and protect the rural landscape of Menorca. An historic family country home is now a hotel with fine-dining restaurant by Chef Miguel Muñoz. Try the lamb terrine; and the local scorpion fish stuffed with Mediterranean herbs; or be tempted by the velvety chocolate mousse with local sea salt and olive oil. Chef Teresa and husband Aleix share their passion for Menorcan Mediterranean cuisine in this informal, friendly restaurant on the quayside in the capital Mahón. Indulge in modern dishes that reflect traditional flavours like pumpkin; subread; lamb; and of course, cheese! 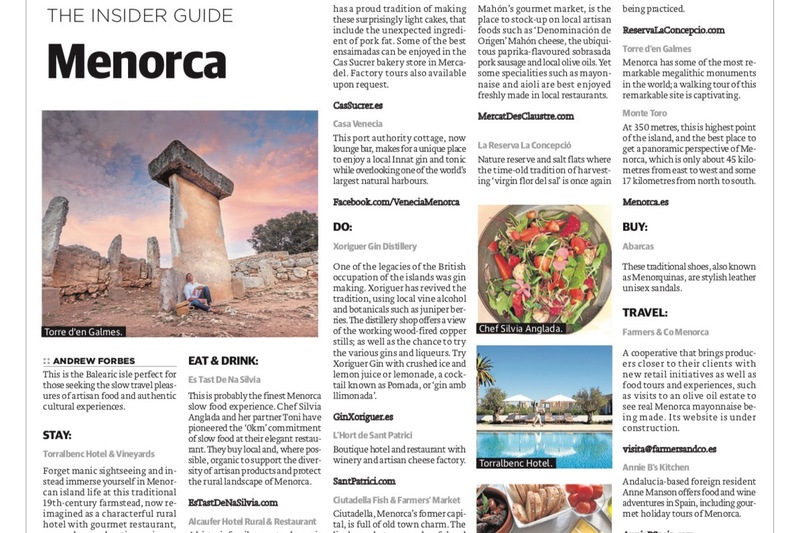 This ‘Eat Menorca’ online guide, created by an association of Menorcan restaurants, is not yet in English, but it offers an interesting insight into the dining choices on the island. They can also organise food tours and experiences. Ensaimadas are the best-known pastry of the Balearics. Menorca has a proud tradition of making these surprisingly light cakes, that include the unexpected ingredient of pork fat. Some of the best ensaimadas can be enjoyed in the Cas Sucrer bakery store in Mercadel. Factory tours also available upon request. This port authority cottage, now lounge bar, makes for a unique place to enjoy a local Innat gin and tonic whilst overlooking one of the world’s largest natural harbours. One of the legacies of the British occupation of the islands was gin making. Xoriguer has revived the tradition, using local vine alcohol and botanicals such as juniper berries. The distillery shop offers a view of the working wood-fired copper stills; as well as the chance to try the various gins and liqueurs. Try Xoriguer Gin with crushed ice and lemon juice or lemonade, a cocktail known as Pomada, or ‘gin amb llimonada’. Boutique hotel & restaurant with winery and artisan cheese factory. Ciutadella, Menorca’s former capital, is full of old town charm. The lively markets are a colourful and fascinating reflection of the island’s produce seasons. Once monastery cloisters, now Mahón’s gourmet market, is the place to stock-up on local artisan foods such as ‘Denominación de Origen’ Mahón cheese; the ubiquitous paprika flavoured sobrasada pork sausage; and local olive oils. Yet some specialities such as mayonnaise and aioli are best enjoyed freshly made in local restaurants. Nature reserve and salt flats where the time-old tradition of harvesting ‘virgin flor del sal’ is once again being practiced. Menorca has some of the most remarkable megalithic monuments in the world; a walking tour of this remarkable site is captivating. At 350 metres, this is highest point of the island, and the best place to get a panoramic perspective of Menorca, which is only about 45 km from east to west and some 17 km from north to south. These traditional shoes, also known as Menorquinas, are stylish leather unisex sandals. A cooperative that brings producers closer to their clients with new retail initiatives as well as food tours and experiences, such as visits to an olive oil estate to see real Menorca mayonnaise being made. Website is under construction. Andalucia-based foreign resident Anne Manson offers food & wine adventures in Spain, including gourmet holiday tours of Menorca. For more on Menorca and its neighbouring Balearic Islands, consult the local visitor sites.